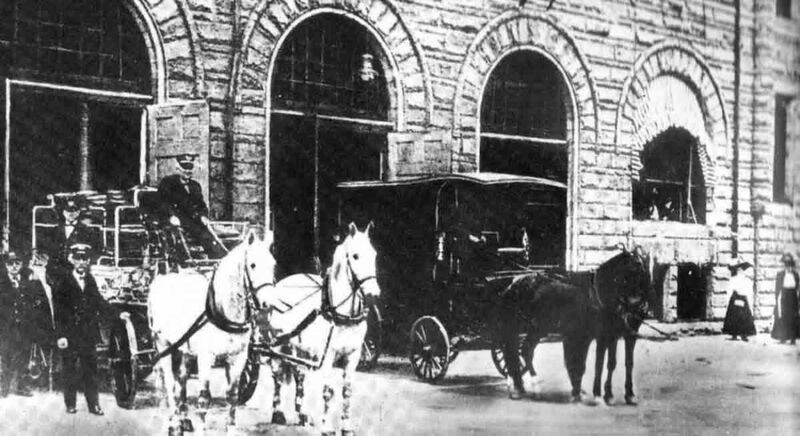 Photo Provided “Mark” and “Ben,” believed to be the black horses on the right, shown attached to the patrol wagon, were replaced in 1913 by a Kissell Kar, specially adapted for service as a patrol car/ambulance. At a city council meeting of November 19, 1913, it was authorized to sell the faithful horses to J.E. Elliott for $110. Mark and Ben, the two faithful old horses that have served the city well for many years, but who by decree of the city council entered some months ago, will give way to more modern methods of travel, were removed from their old quarters at the city building Wednesday afternoon and taken to City Park, along with the old patrol wagon which they have drawn for the past several years. Both the horses will remain at the park until October 29 when bids will be received by the city for their sale and they will probably fall into the hands of other individuals or interests whether for better or worse remains for time to demonstrate. Immediately upon the removal of the faithful old team the new combination patrol and ambulance which arrived here Tuesday was placed in position, where the old patrol stood when not in use. It was with sincere regret that members of the police and fire department witnessed the relegation to the rear of the faithful old team, and most of the members of the department have given expression to the hope that the city might arrange some plan by which they might be retained in the city service. Members of the fire department were particularly attached to “Old Mark” who prior to being placed in service in the patrol wagon, responded to many alarms while serving the city as one of the fire horses. The old horse which was purchased from a man named Toomey back of Belleville, entered the fire department service about fifteen years ago. Taking the place of “Old Jim,” who became disabled for service and passed into the ownership of Peter Mark, who was then engaged in the fruit business here. Ben came directly into the service of the city as a patrol horse about seven years ago, and during his connection with the police department worked faithfully along with old Mark. Had both of the faithful old horses means of expressing their feelings it would no doubt be with a sigh that they have with many other faithful steeds fallen victims to demands of more speedy methods of travel, and with regret that they have been removed from their old friends, the police and firemen. The wagon unto its goal. They should have been born with wheels.